The Scary Stories To Tell In The Dark series included some of the most terrifying books of all time, mostly due to the positively soul-destroying illustrations by Stephen Gammell. The books were re-released later with less-scary art that significantly diminished their appeal, and although a movie version of the series is in the works from Guillermo Del Toro, the world’s bookshelves are sorely lacking in new scary stories that can be told in the dark. 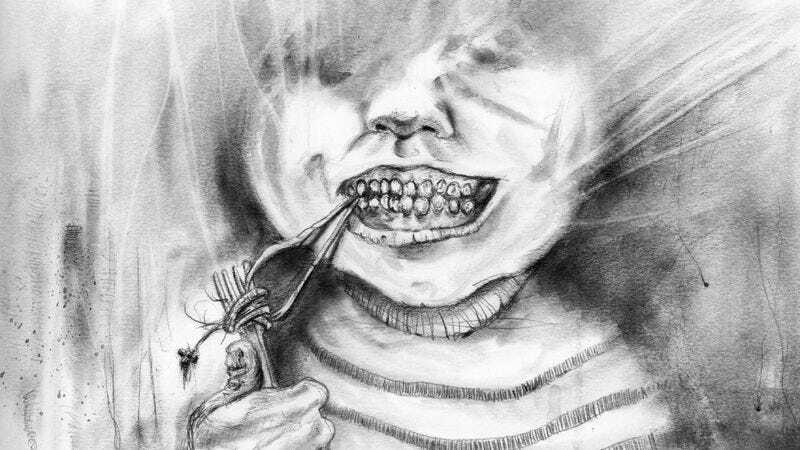 However, a project called Nightmare Soup: Tales That Will Turn Your Stomach is looking to fill that hole by becoming the spiritual successor to Scary Stories that ‘90s kids have been dreading for years. The book will feature 30 short stories and Gammell-inspired art by Andy Sciazko, and it’s currently raising money with a Kickstarter campaign. The creators say that the book will happen even if the Kickstarter fails to reach its goal, but the campaign will “certainly help it along.” They have 16 days to raise about $10,000, and anyone willing to contribute can get free copies of the book or signed illustrations, depending on how much they donate. Speaking of the illustrations, the creators behind Nightmare Soup have released a bunch of preview images, and they certainly feel like a worthy homages to Gammell’s originals.